← Do consumers still aspire to performance cars? Driving the American way: The best way to travel? So I have moved to Canada for now, the second biggest country in the world. It also has a population of only 33 million inhabitants, which is about half of that of France. This means it’s not a very densely populated place, which equals to vast empty spaces all around the place. To say it can be desolate would be an understatement. I thought Northern Scotland was empty, but I had not yet driven 20 miles without encountering a single vehicle. It also means, when you look at a map, distances are not what they seem. When I first looked at doing a Montreal-Toronto trip, I thought it would take about 3 hours. Turns out it is more likely to be 7. On the freeway, the speed limit is only 100km/h, or 60 mph. It is also very straight. This looked like a very boring trip. The car I had, a 2012 Chevrolet Cruze is not the most exciting out there, though more on that in a later post, so I was preparing myself to be bored out of my mind during the road trip. The combination of an automatic gearbox and cruise control almost had me fetching my pillow before leaving. However, once on the road, it was actually pretty interesting. Canada is very big, but also a very beautiful place. Cruising along the freeway with no rush was a soothing experience. Take the car up to speed, set her in cruise and then just take in the scenery. 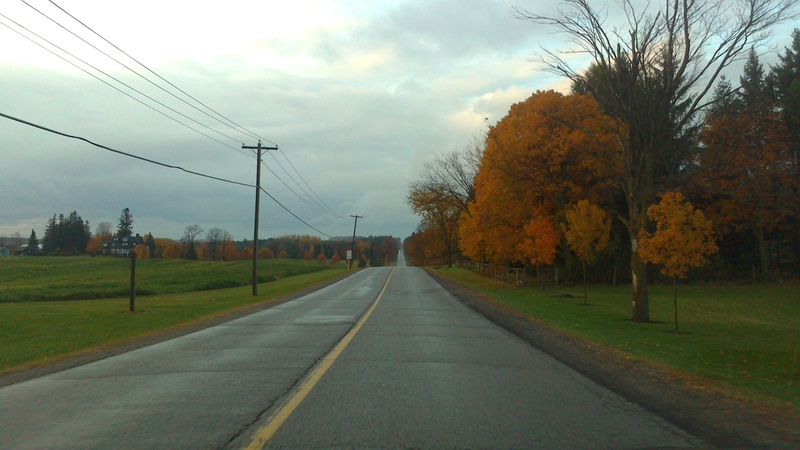 It is now autumn, so the trees were wonderful orange and red colours, the sky was blue and the fields were golden. The car, being automatic was quiet and relaxed. I was not really driving, more like just enjoying the ride. The amount of country music on the radio also made me feel like an American traveller. Driving that little bit slower was the difference between rushing to a place, and enjoying the drive. Sure, driving along small winding mountain roads in a lightened BMW M3 would have been much more fun, but for 6 hours straight, it would tend to wear a bit, and I would arrive looking as if I had completed a marathon. On this long stretch of road, taking it easy and relaxing was a good way to do it. But then I decided to get off the freeway and just go along the very small country side roads running alongside. This was one of the greatest ideas I ever had. Yes, you need to have time to waste, as it can take twice as long and yes you are driving pretty slowly. But driving on the lonely roads, passing through a sleepy town from time to time, and enjoying the magnificent scenery was an incredible experience. You took your time, you looked around. Sometimes the road would stop and would actually turn into a dirt track, but that was okay. I felt completely free, no pressure, no queues of cars before or behind me, no pedestrians running around, nothing. 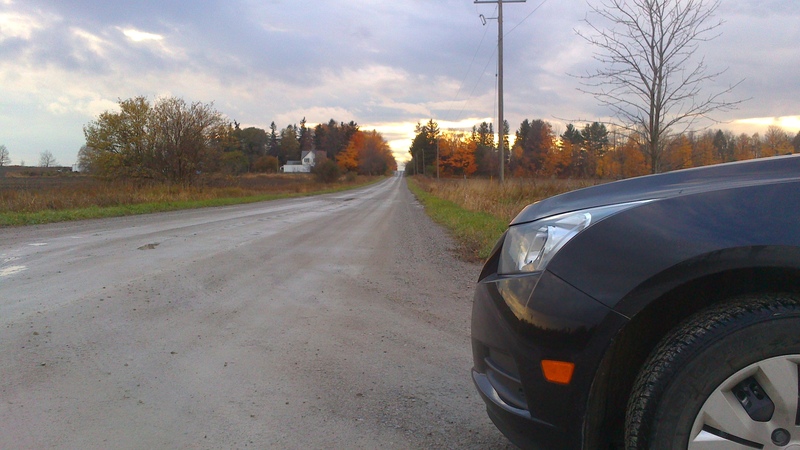 It was just me, the car, the road and Canada. To paraphrase the Ontario motto, it was ‘Mine to Discover’. And right there, among this vast space of discoveries, I realised something. Yes, the roads were always straight, so it could be boring. Yes, the car was pretty comfortable, so I was not involved with the road and yes the automatic gearbox meant I forgot all about the connection between me and the car. It was different. I was no longer driving, I was travelling. The focus was no longer on the driving experience, but the experience around me. The American way of driving started to make sense. Why would you want a lightened sports car if you are going to drive 150 miles in a straight line? Why would you even need an manual? Driving the American way meant going places I would have never gone before, exploring new areas. When I saw something in a sleepy little town that interested me, I would stop. If I found a new road that took my fancy (maybe even with a corner in it), I would just go. It was complete freedom. And because the country is so huge, the possibilities of doing this are virtually endless. I wrote some time ago how driving at night was a form of therapy. Well, in my mind, driving the American way can also be considered as one. There is nothing to care about, no pressure and no worries. It is all incredibly relaxing. If I was in a car that asked for a lot of involvement, I would not enjoy the trip as much, but I would enjoy the car. Funnily enough, in order to make the most of the travel experience, you need to detach yourself from the act of driving. You could also see this another way; maybe the car was so bad that I tried to focus outside to avoid depression, but in keeping with my objective theme, I will go with the first reasoning. The focus of this blog is to enjoy the act of just driving to a location and how the ways to do this change. At the basis, there are two ways to do this: Enjoy the ride (that means the car), or enjoy getting there (that is the countryside). With changing times, it seems the focus is more on the latter solution. Think about it, with an electric car, you would be forced to enjoy the scenery, as you stopped every 100 miles to recharge. But does it have to be so? I think both can be done, and I will prove this someday! But as long as I am in Canada, with so much exploring to do, and access to some pretty dull cars, looks like I will just enjoy getting to places. Unless Toyota or Subaru reads this. Driving a FRS/GT86/BRZ around Quebec probably would change my mind! I could also settle with a C7 Corvette, if you are reading me, GM. This entry was posted in Philosophy of driving and tagged american, bmw, canada, chevrolet, driving, relax, travel. Bookmark the permalink. 1 Response to Driving the American way: The best way to travel?